Here's how to make a piecrust for a 9-inch single-crust pie. For a 9-inch double- or lattice-crust, just double this recipe. Put the Crisco in a medium bowl. Over it, pour the flour and the salt. With a pastry blender (some old timers use a fork), cut the flour and salt into the Crisco until the mixture resembles coarse meal. One tablespoon at a time, sprinkle the ice water over the mixture, and work it in with the pastry blender. You may not need all three tablespoons before the dough comes together and can be pressed into a ball. Remember, the less you work the dough, the lighter and flakier the pastry. Flatten the dough ball into a 6-inch circle, wrap in plastic wrap or waxed paper, and refrigerate for 30 minutes. Place the chilled dough between two sheets of waxed paper and roll to a thickness of about 1/8 inch in a circle about 12 to 13 inches in diameter. Pell off the top piece of waxed paper, invert a 9-inch pie plate on dough surface, and turn the sheet of dough and the pie plate over. Center the dough on the pie place, if necessary, and peel off the second sheet of waxed paper (tear off in pieces if you like). Fit the dough into the pie plate without stretching it. If the dough tears a little, just pinch it back together. Trim the dough to overhang the edge of the pie plate by about 1-1/4 inches, then turn under to make an edge. You can put a fancy crimp in the edge at this point, if you wish. An alternative method is to dust your work surface or pastry mat liberally with flor, and then roll out the dough to the proper size. The dough can then be rolled up (loosen an edge with a spatula or baker's bench knife) on the rolling pin and transferred to the pie plate. Now your unbaked pie shell is ready to be filled with whatever filling you wish. 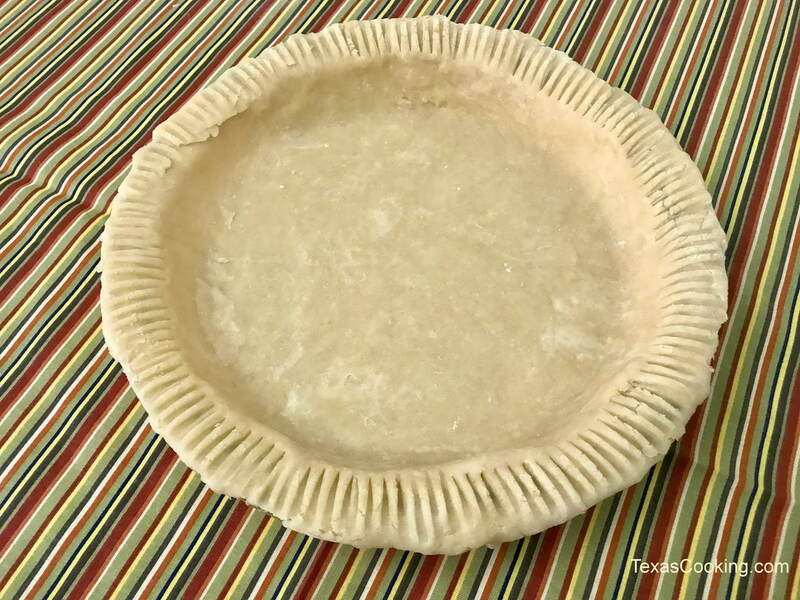 For a pre-baked pie shell, once your pastry is in the pan, trimmed and crimped, prick the bottom and sides of pastry with a fork to avoid air pockets developing, and bake in a 425°F oven for 10 to 12 minutes until the crust is lightly browned. Makes one 9-inch single pastry crust or 9-inch double crust (if recipe is doubled). Note: To make your piecrust in a food processor, put the flour and salt in the processor bowl. Pulse a few times to mix. Add the shortening to the flour mixture, and process about 10 seconds until mixture is the consistency of coarse meal. With the food processor running, slowly add ice water in a thin stream just until the dough holds together. Do not process the dough for more than half a minute. Conventional wisdom holds, and I agree, that glass (Pyrex) pie plates generally make better pie shells than those made of metal.